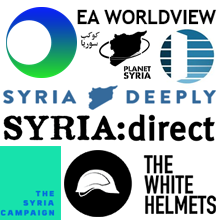 Syrian civil society activists from Planet Syria have called for an international day of action against Russia's bombing of Syria on February 23rd. Syria Solidarity UK is calling on all those opposed to the Russian backed and perpetrated slaughter in Syria to join us in demanding an end to Putin's bombing in Syria. 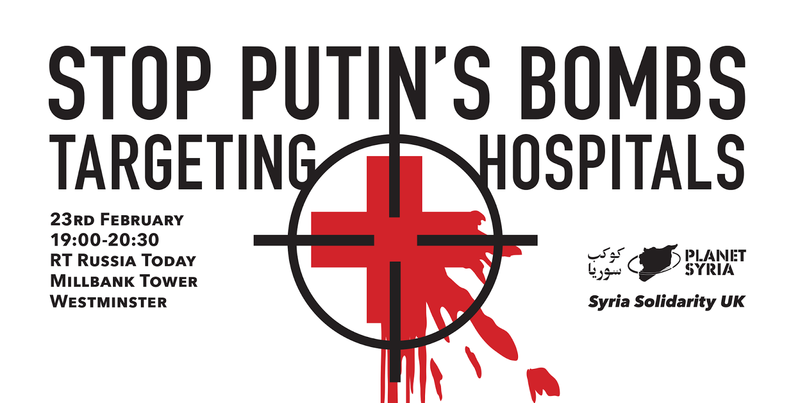 The protest will take place at Russia Today UK's headquarters at Millbank Tower. 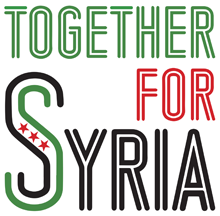 Planet Syria is a coalition of Syrian civil society organisations. Anatomy of a Crisis: A Map of Attacks on Health Care in Syria, Physicians for Human Rights. Syria: Report documents war wounded and war dead in MSF-supported medical facilities in Syria, Médecins Sans Frontières‎/Doctors Without Borders, 17 February 2016. Refugees are becoming Russia's weapon of choice in Syria, Simon Tisdall, The Guardian, 16 February 2016. At Least 25 Killed in Attack on MSF-Supported Hospital in Northern Syria, Médecins Sans Frontières‎/Doctors Without Borders, 15 February 2015. Syria crisis: Strikes on hospitals and schools kill ‘up to 50’, BBC News, 15 February 2016. Syrian Hospitals Hit as Battlefield Grows More Chaotic, Anne Barnard, The New York Times, 15 February 2016. Russia killed more Syrian civilians than Assad or ISIS in January: Report, by Damien Sharkov, Newsweek, 15 February 2016.